I have to admit I struggled with the Author's last book; the award winning 'Feet in the Clouds'. It must have been me because it has so many positive reviews and is one of the most popular running books out there. I've never got to the end, I keep trying as I feel I should, like I'm missing out; alas. "Even when the window through which I'm gazing belongs to an urban office, my notional self will skip unthinkingly over jostling traffic jams and pavements, escaping to the unexplored parks, rivers and open spaces.....But I notice it most when I'm looking at the passing countryside from a car or train"
That's exactly what I'm thinking most the time, I had connected to the book in the first paragraph, and I stayed connected throughout. The words on the cover 'A runners journey back to nature' describes the book brilliantly, how the author has relaxed in his running and connected with the real joys of running in the countryside. Gone are the days of chasing PB's and pounding pavements, even the sports watch has been disbanded; "By the time I reached my mid-forties, then the watch becomes a tool not of motivation but of discouragement"
Essentially this is a diary of running through the seasons on the Northamptonshire countryside with his faithful running partner, Nutmeg the dog. The accounts are described so beautifully that you want to lace up your trainers and get out in the countryside whatever the weather. I could relate to many things in the book, from the sounds of the first woodpeckers heard in spring to running in heavy downpours of a wet Winter. One experience I couldn't relate to and I don't think many of us could, was where by a chance meeting, Askwith regularly for a period of time became 'the hunt' for the local farmers Bloodhounds! Something certainly different and a novel way of getting the miles in for the week! Chapters of the authors seasonal running, are broken intermediatley with chapters exploring the reasons of why we run and escaping the multimillion pound industry that goes with running. From the price of our shiny branded kit to the racing events that we pay for the priveledge of doing something that essentially should be stripped back to simply putting one foot in front of the other. 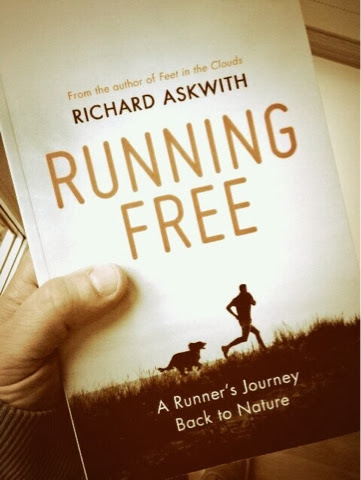 This works really well through the book challenging and provoking the reader on subjects such as obstacle races, gym's, urban running, the expense of running kit and barefoot running of which Askwith is an advocate of. From an author whose first book I couldn't relate to, and from all the running books I've read (and I've read quite a few!) this book has to be one of the best I've read. Askwith talks through the book about the seven ages of running that he came up with. The first age being the novice, happy to run their first miles, to the second age of running which now excites, where life has to to be juggled to accommodate this new habit. The third age where there's no longer huge bounds in improving PB's so one looks to all running sources for tips and advice, and having all the latest shiny kit is a must! Somewhere after these early 'ages' of running is where I'm guessing the 53 year old author is now, back to basics and simply running for the enjoyment and no other reasons, no times recorded, no distances logged. I'm ten years younger than the author but feel I'm at the same 'age of running' as Askwith, which is why the book was so enjoyable. This book must become a part of any runners library. I urge you to read, It will become a bestseller and a classic to surpass his first. Running free, by Richard Askwith, published by Yellow Jersey Press is available from 6th March 2014.